An Illinois State Police trooper who had used marijuana for pain management may be able to keep his job after action from the state House. State Trooper Michael Cokins is facing dismissal despite an exemplary record and being hit by a drunken driver four years ago. A zero-tolerance policy for state troopers and Department of Corrections officers regarding positive tests for marijuana had put Cokins’ career in jeopardy. Cokins tested positive for marijuana in 2017 after returning to work after months of physical therapy, following being hit by a drunken driver on Interstate 294 near Elmhurst. After testing positive, Cokins admitted to State Police officials that he had used marijuana for pain management. 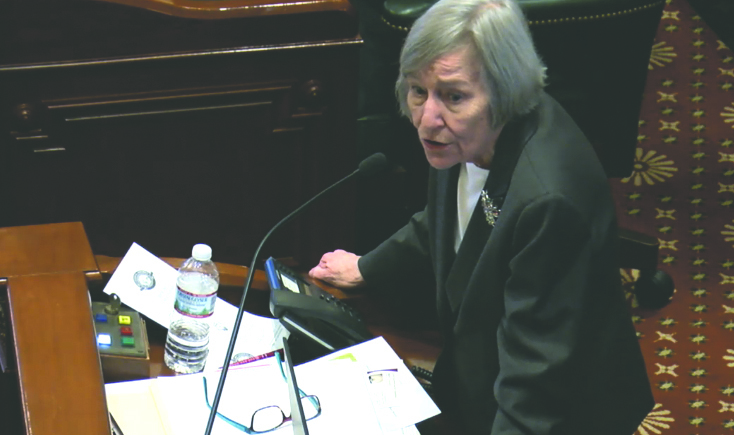 State Rep. Barbara Flynn Currie (D-Chicago) noted that Cokins’ ordeal included eight separate surgeries and many hours of rehabilitation. “An anomaly in the law means he’s about to be fired,” Currie said during Nov. 27 discussions on the House floor when the issue was discussed. “Failure of an alcohol test does not require mandatory dismissal, but for marijuana it does. The legislation, that got enough votes in both the House and state Senate to override the governor’s veto, calls for working that simply changes the wording of disciplinary action, giving the State Police Merit Board and Department of Corrections officials the authority to, but not requirement to, fire an individual for a positive drug test. Skillicorn also clarified some concerns by House members that as the law now stands, individuals such as state troopers, cannot possess both a Firearms Owner Identification Card and a medical marijuana card. 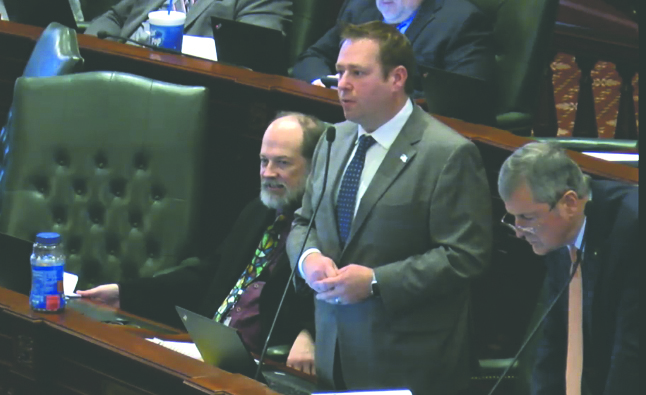 The East Dundee representative said the problem that comes up is when an individual who already has a FOID card and a medical marijuana card wants to buy another weapon. “They cannot legally testify that they are not violating any federal laws,” Skillicorn said as marijuana of any kind is still against the law on the federal level. Skillicorn said the legislation was “common sense” and encouraged the override. “It is a good idea to keep state troopers that may have a medical card still employed with the state,” he said. House members agreed with Skillicorn and Currie, providing 84 votes in favor of the veto override. 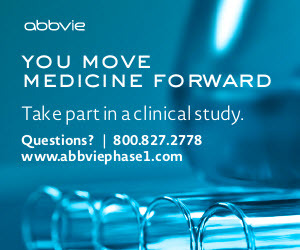 A total of 71 “yes” votes were required for the override. Gov. Bruce Rauner vetoed the legislation because he felt that only individuals with a medical marijuana card should have a chance at reinstatement as a state trooper or Department of Corrections worker. Currie said it is better to have leaders in the State Police and DOC decide who should get a second chance. 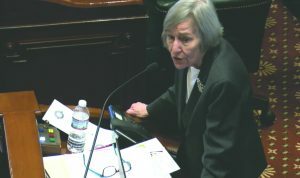 She said the override was an important step for Cokins and state troopers, as well as workers in the state prison system. “It is important to this young man who almost gave his life for us, but for other young men and women who could one day find themselves in the same situation. Cokins suffered 15 broken bones and had 17 months of physical therapy after the 2014 accident. 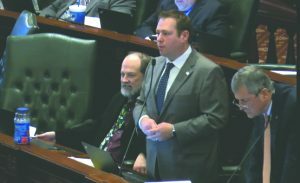 “He acknowledged that he made a mistake, that he had used cannabis two days before the test, mostly to relieve the pain that was constant in his life after this accident,” state Senate President John Cullerton (D-Chicago) said earlier in November when leading the Senate’s effort to give Cokins the opportunity to stay on the State Police force. In September 2014, less than a year after joining the State Police, Cokins was hit during a traffic stop of another vehicle on I-294 at St. Charles Road. Leslie Thurow, the driver of the car that hit Cokins, was charged with aggravated driving under the influence of alcohol, leaving the scene of an accident and aggravated reckless driving. Thurow, of Mount Prospect, had a blood alcohol level more than twice the legal limit, police said. It was her fourth incident of drunken driving, according to law enforcement officials. She was sentenced to 13 years in prison for the incident.